“Get Connected” 2017 NSBC kill switch campaign encouraged connecting kill switches to prevent being ran over by the propeller in the event the operator was ejected. A propeller safety campaign was announced in Australia by New South Wales (NSW) Maritime in January 2010. The program is called , Take Care – Be Prop Aware. They will be supplying packets of t-shirts, brochures, and stickers to hundreds of locations. It includes a propeller safety brochure somewhat similar to the 2006 USCG Propeller Injury Awareness brochure, and a nice prop safety decal. We strongly commend NSW Maritime for their actions and wish their campaign well. Dan (Diving Accident Network) Europe has had a long running Dan Europe Propeller Injury Prevention Campaign focusing on preventing propeller injuries to divers. Propeller Injury Awareness Brochure. U.S. Coast Guard. 2006. We assisted in the development of this brochure. Not a Campaign but, Seaworthy Magazine, published by BoatUS, has a nice Avoiding Propeller Injuries page dated April 2012 that lists many of the classic tips to avoid boat propeller injuries. 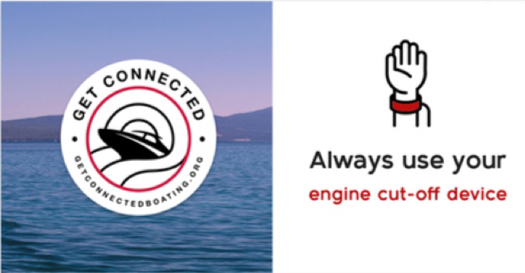 Powerboat & RIB Magazine, a U.K. boating publication, distributed free warnings encouraging boat operators to attach their kill cord (UK calls kill switch lanyards, kill cords) in the wake of the Milligan accident. In late September 2010, the U.S. Coast Guard released a Public Service Announcement consisting of a video along the theme of some existing YouTube boat party videos, but it ends with a propeller accident and encourages boating safety. This PSA video was later pulled from distribution due to industry pressure. We cover the video and the controversy on our Propeller Safety PSA Response Reveals Boating Industry’s True Colors page. While not specifically a campaign or a Public Service Announcement, Stop Propeller Injuries Now (SPIN) has long been a force for boat propeller safety and was the genesis behind several of the efforts above. If anyone is aware of any other propeller safety campaigns, please contact us.